Iran’s vice president says the reason behind the imminent collapse of the Israeli regime is its tyranny and atrocities against Palestinian people. “The Israeli regime is moving in the direction of tyranny and oppression, and will have no fate but annihilation,” Ali-Akbar Salehi said in a Sunday ceremony in Tehran. The ceremony, called “Gaza, the Symbol of Resistance”, focused on the Israeli atrocities against the Palestinian nation, and the oppressed people’s struggle against the Tel Aviv regime during the past decades. 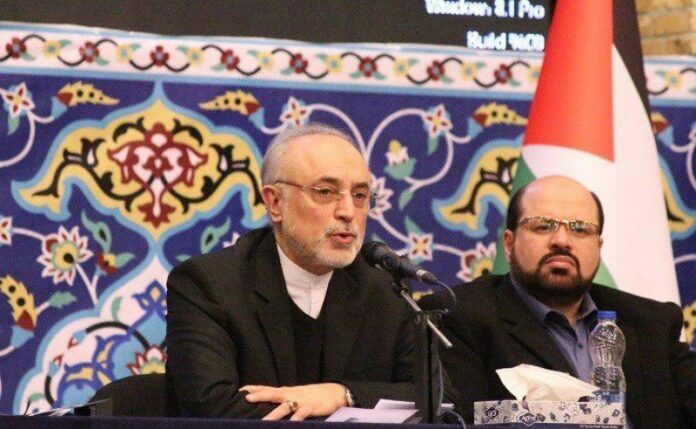 Salehi also highlighted the efforts made by the Islamic Republic of Iran to contribute to these struggles, saying that the 1979 Revolution of Iran managed to help Palestinian resistance forces get on the right track and even revive Islam for them. Salehi, who is also the head of the Atomic Energy Organization of Iran (AEOI), said Iran is a developing country and enjoys a lofty status in terms of international relations. He noted that the AEOI is the symbol of the country’s power and dignity and is in a position where it is engaged in a major challenge with world powers. “At one side of the table sit the five permanent members of the UN Security Council plus Germany, and on the other side of the table sits the Islamic Republic of Iran,” said Salehi. He also said the Iranian nation has a very bright future ahead.